What !!! - No Royal Commission??? The new Rudd government and Immigration Minister Chris Evans swiftly moved to close down John Howard's Pacific Solution. They brought all remaining Burmese Rohingya and Sri Lankan asylum seekers from Nauru to Australia. They granted them permanent visas as bona-fide refugees. Chris Evans also quickly settled a compensation deal for Cornelia Rau in the first week of the new Parliamentary year. Then he moved swiftly to deal with the almost 250 cases of unlawful detention, identified by the Commonwealth Ombudsman for Immigration. These were cases where the Immigration Department was awfully wrong to lock up nearly 250 people in Immigration Detention centres or jails. All good then so far? Not really. Chris Evans has also quickly backtracked on his earlier vigorous commitment to demand a Royal Commission into the Immigration Department's dealings with refugees and asylum seekers. On this page you'll find three items plus one of the many community initiatives to establish a Royal Commission. First, an article from the hand of Ian Rintoul, Coordinator of the Refugee Action Coalition, and commissioned by the ABC. In the article Rintoul outlines the high importance of having nothing less than such a Royal Commission. Next, there's a transcript of a Doorstop interview with Chris Evans on 25th May 2005, where he clearly states that nothing less than a Royal Commission, not even a Judicial Inquiry, will be required to bring the issues out into the open; thirdly, there are the Chris Evans "backflip" remarks to AAP reporter David Crawshaw in the context of the government's settling of a compensation deal with Cornelia Rau, on February 19, 2008. Relevant sections are accented in bold and red colour. The page concludes with one of the many Royal Commission calls that have been made since the 2001 days of the Tampa stand-off, the Children Overboard scandal and the Cornelia Rau and Vivian Solon-Alvarez debacle. If you're reading this page, you're probably already aware of the Project SafeCom Royal Commission petition initiative. The page for the petition is linked below in the Related pages, or you can access the page here. The call for a Royal Commission into detention and the treatment of refugees, asylum seekers and immigration detainees has always been relevant, especially since the 2001 Tampa stand-off. With Downloadable Petition Form! 24 January 2008: Howard Mandarins and Labor Ministers - while some advocates seem to ride a wave of euphoria that followed the November 2007 Federal election that saw John Howard assigned to the political scrap heap, Immigration Minister Chris Evans' trip to Indonesia has called forth some critical comments for more senior commentators amongst our ranks. 27 November 2007: The ALP's me-too refugee policy: Australia will keep turning the boats back - The Howard Years have finally come to an end with a resounding victory for the Rudd camp, and while we know that we will be 'more amongst friends' than before, there is still a lot of work ahead for us, in terms of creating a wholehearted implementation of Australia's obligations as a signatory to the UN Refugee Convention. The new Labor government got off to a good start on the vexed question of refugee rights. The off-shore detention centres of Nauru and Manus Island have been closed and the Sri Lankan and Burmese asylum seekers brought to the mainland. One of the Afghan families stranded on the Indonesian island of Lombok since the aftermath of the Tampa in 2001 is now being processed. So far, so good! But there are worrying signs that Labor may not have the political will for the hard yards to undo the legacy of the Howard years. There have always been problems with Labor's policy. The bi-partisanship was still on display in the run up to the election. Labor supported Andrews' cap on African refugee intake. It supported Andrew's cancellation of Mohammed Haneef's visa. While the Labor government says that there will be an inquiry into the Haneef fiasco, Evans has ruled out an inquiry into the Immigration Department. Yet Chris Evans himself in May 2005 was adamant that a Royal Commission into unlawful detention was needed. "It was the most disturbing moment in my twelve years in the Parliament ... It's clear a Royal Commission is needed. Anything less will leave the Australian public dissatisfied with the result," he said. No Royal Commission means that we might never get to the bottom of who was actually responsible for department's practices that led to the deportation of Vivian Solon. We may also fail to get answers about who was responsible for the decisions to use false documents to deport asylum seekers. And the truth about the persecution of the Bakhtiyari family will stay hidden. It will be that much harder to rectify the wrongs. It will mean that every abused asylum seeker will have to mount costly and difficult legal challenges to get compensation for the suffering inflicted on them in detention, just as Shayan Badraie and his family had to. Does Evans' decision mean that an inquiry into the sinking of the SIEV X is also in doubt? Evans now says he is satisfied that "progress was being made towards cultural change in the department". But the evidence for progress is scant, least of all from the Minister or his office. Peter Shergold, the Head of Howard's Department of Prime Minister and Cabinet during the notorious children overboard affair recently refused to answer question about that incident, but at least he had the decency to resign. Bill Farmer, head of the Immigration Department though some of the darkest days of abuse under Howard, is the Australian ambassador for Indonesia who Chris Evans met with when he visited Indonesia in January. The notorious jackboot boss of Curtin and Baxter detention centres, Greg Wallis, holds a post in the Australian consulate in Lebanon. Andrew Metcalfe, the present head of immigration has risen through the ranks as the architect and technician doing the dirty work of the Howard government, including Tampa and SIEV X. He was condemned by Tony Burke when Labor was in opposition as being "steeped in the department's culture of cover-up." Chris Evans' advisers were recently hauled over the coals by refugee advocates for their persistent use of "illegals" referring to asylum seekers. HREOC recently called for an end to mandatory detention and condemned the prison-like facilities at Villawood detention centre. Yet his office has just rejected the recommendation of the Ombudsman to release a Chinese asylum seeker who has been in Villawood for almost four years. And nothing has changed inside Villawood itself. Labor has declared that the Pacific Solution is dead. It is a welcome move. But the use of Christmas Island as part of the Indian Ocean solution is very much alive. Chris Evans visited the remote Guantanamo-like facility on his way to Indonesia in January and announced that the facility would soon be open for business. This means that future boatloads of West Papuans, Sri Lankans, or Burmese who don't make it to the mainland will end up on Christmas Island unable to access Australian law or support in the Australian community. When three Indonesian fishing families were recently repatriated from Christmas Island purely on the basis of interviews with Immigration officers with no advice or representation, alarm bells went off among refugee advocates. Is this cultural change? Wasn't this exactly the treatment dished out to asylum seekers taken to Nauru? Labor policy has always been couched in the border protection rhetoric of the Howard government. And they have always been committed to keeping Christmas Island, Cocos Islands and Ashmore excised from the Migration Act. But despite earlier promises, Chris Evans is now reported as saying that all the thousands of islands to the north of Australia will remain excised. Labor's website has been doctored to remove Tony Burke's commitment made to the Labor Conference last year to un-excise these islands. Is it merely a coincidence that this was edited immediately after Evans' trip to Indonesia? It looks like it is the immigration department that is setting Labor's agenda. It is not just the rhetoric. Labor remains committed to keeping the essential elements of Howard's policy of ­mandatory detention, border protection and off-shore processing. Even after meeting with Chris Evans, refugee advocates had no timetable for fulfilling Labor's central promise of replacing Temporary Protection Visas with permanent protection and putting detention centres back under government control. Meanwhile, the misery of detention continues, and those who have committed no crime remain held in appalling conditions while their mental health declines day by day. And the machinery of deportation still turns inside the department. There is so much unfinished business. The impact of eleven years of Howard's immigration policy runs so very deep. We are still waiting for action on work rights for those on Bridging Visas, waiving the detention debts, replacing the adversarial Refugee Review Tribunal with a humanitarian tribunal that embraces complementary protection and a commitment to human rights. Not to mention the return of judicial appeal rights and de- linking on shore and off-shore quotas of refugees. 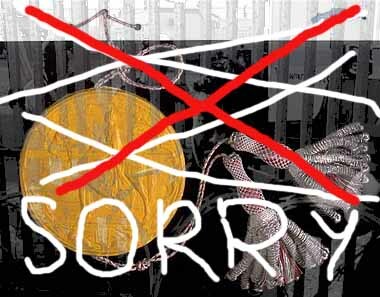 Given the government is in a mood for apologies, what about saying sorry to the victims of immigration policy. This would provide some indication that the new government really does have a commitment to the fundamental policy change that's needed. EVANS: Thanks for coming this morning. I want to make a few comments about what occurred at Estimates Committees last night in the Senate. I think it was the most disturbing experience I've had in twelve years in politics when the Department of Immigration revealed that it knew, as early as July 2003, that Ms Alvarez-Solon Young had been deported by them despite the fact she was an Australian citizen. They had known for two years and informed the Queensland Missing Persons Bureau that they knew they deported this Australian citizen for two years before any action was taken then her former husband alerted them to the fact. So, we have the situation where DIMIA knew for a whole two years that they illegally deported an Australian citizen and took no action to rectify their error to bring her back from the Philippines or in fact to ensure her well-being. I think it's the most scandalous thing I've heard and I think it makes the Government's defence in their opposition to a Royal Commission totally unstainable. The Minister also made clear last night that Mr Palmer will only be involved with these inquiries for another three weeks. That he will only effectively deal with one of the now 203 cases that have been referred to the inquiry and it appears from Lateline information last night that Mr Palmer will effectively play no more role in the inquiry after he reports on the Rau case in three weeks time. That means that he'll deal only with one of the 203 cases referred to him and it's now suggested that even he is supporting the call for a Royal Commission. The Government must call a Royal Commission. Their current position is unsustainable. They at least admitted yesterday that major reform needs to take place but the most damning indictment was their own evidence that that department knew for a full two years that they deported an Australian citizen and did nothing to rectify the error. Nothing to save Ms Solon-Young from her fate or to ensure she got proper treatment. JOURNALIST: Would you accept a judicial inquiry into this with Royal Commission powers if you're not going to get a Royal Commission? EVANS: I think even the Government now will have to realise that a Royal Commission is required. It appears Mr Palmer is now arguing for that. It's obvious, that with 203 cases now referred with the damning evidence last night of systematic failure to protect Australian citizens a Royal Commission is needed. It's also clear that by involving now Queensland Police and the Missing Persons Bureau that those Officers are going to want protection before giving evidence. It's clear a Royal commission is needed. Anything less will leave the Australian public dissatisfied with the result. And quite frankly you can't have a more serious case when the Department read out their email that admitted they knew in 2003 that they deported an Australian citizen. As I say, it was chilling. It was the most disturbing moment in my twelve years in the Parliament and I think all Australians will realise that a Royal Commission is required. The Government's position is unstainable. I suspect the only reason there isn't a Royal Commission already is, I think, the Government accepts if a Royal Commission is called Amanda Vanstone's position is untenable and she'll have to go. But, there's no question in the public interest a Royal Commission is needed. JOURNALIST: From what you've seen so far, do you think heads need to roll at a Ministerial level and in the Department? EVANS: Clearly, there's been tremendous failure. They have failed Australian citizens on two major occasions and now we know there are 201 more cases that require serious investigation. This is probably one of the most serious allegations against a Government Department in the history of the Commonwealth. It really does need a Royal Commission to get to the bottom of it and I think there's deep community concern now about whether people are going to be treated properly. EVANS: We have evidence that suggests that Senator Lightfoot has not declared his share tradings and financial interests in major companies in accordance with the rules of the Senate. I will this morning, be referring those matters to the Privileges Committee in the Senate. Senator Lightfoot is becoming a serial offender in terms of the Declaration of Senators' Interests. This is a question that is central to our democracy that the public knows where Members of Parliament are getting their income from, what might be influencing their decisions. I think if Senator Lightfoot has failed to properly disclose his interests for a third time then the Senate will take a very serious view of that. But, as I say, I'll be referring these allegations to the Senate Privileges Committee today for investigation and report but Senator Lightfoot has some very serious questions to answer. Could I just say something about a couple of the other matters that were revealed last night? Some of you may have been tucked up in bed or otherwise engaged. But first of all, in terms of the Prime Minister's announcement yesterday that the Vietnamese baby Michael Tran, will not be returned to Christmas Island. An hour and a half after the Prime Minister made that statement in the Parliament, Senator Vanstone and her officials were still insisting to me at Estimates that the baby would be retuned to Christmas Island as soon as the mother and child were well enough to travel. This was policy on the run by the Prime Minister. He made it up under pressure in Question Time yesterday. The Department assured me in the morning and again in the afternoon following the Prime Minister's Question Time, which obviously they hadn't been informed about, that following his Question Time answer, an hour and a half later they were still maintaining that Departmental policy was that the baby, and its mother and father be returned to detention on Christmas Island. If one looks at their regulations, that's correct. The decision by the Prime Minister to announce suddenly that they could stay in Perth, not in detention, is not consistent with any of their regulations or guidance. It was policy on the run from a Prime Minister under enormous pressure about his treatment of refugees. He didn't want to have to explain that under the Government's policy, the baby would go to prison within days of its birth on a remote territory. So, I think that's an example of how the Government's under enormous pressure on this issue. I think the other matter I wanted to mention and I think the media will be particularly interested in this issue is late last night it became clear that the Government took the decision not to reveal the name of Ms Alvarez-Solon Young to the media when it became obvious to them that they deported her. They in fact decided to keep that secret as they searched for her, refused to release her details. They in fact refused to tell her relatives in Australia and the Philippines that they had deported her even though the Secretary and the Minister knew from 21st April that that in fact was the case. And when they contacted her relatives they continued to pretend that they didn't know that they deported her to the Philippines when they inquired whether they had seen her or not. So, her half-brother in Australia was contacted and asked whether or not he knew of her whereabouts when they knew and had known for two years that they deported her to the Philippines four years earlier. So, these are very serious issues but the key point that emerged last night is that no one from the Department of Immigration had spoken to Mr Young, Mrs Young's former husband because the Chief of Staff of the Minister, Senator Vanstone, had requested that the matter be kept secret, they say on the request of Mr Young. But, the Minister's office was the office that was responsible for ensuring that the information that they were searching for Ms Alvarez-Solon Young was not released to the public. And it was only as a result of media inquiries that she was found. It seems if the media hadn't intervened and searched for her, she may still not have been found because for three weeks the Department had been looking for her but refusing to make any public appeal. So, when the Minister talks of the culture of the Department, we now see that as late as early May this year there was still a culture of secrecy, of refusing to be open with the public. They had known for two years they had deported her, they refused to admit that mistake but they refused to encourage the media or the public to be involved in the search for her. And, quite frankly, if it wasn't for the media intervening she may never have been found. The Minister's office continued to hold that question secret, the identity of Ms Alvarez-Solon Young and refused to admit that they had deported her. But, as I say, without the media's intervention she may never have been found. But the Minister's office had ensured the matter stayed secret and that Ms Solon Young was not found by the Departmental officials because of the secrecy of that investigation. I think that's a very serious matter because it goes to the heart about whether the Minister and the Government had been open about these matters. The fact that they were still trying to cover up the fact of her disappearance some three weeks after they learnt they had deported her I think is a scandal. And I think the Minister is going to have to be held accountable for those issues as well. CORNELIA Rau, the German-born woman wrongly held in detention for 10 months, has accepted a compensation offer from the Federal Government. Immigration Minister Chris Evans confirmed to a senate estimates committee today Ms Rau's lawyers had agreed to the deal. "I can advise that Cornelia Rau's lawyers have communicated to the Commonwealth that they have accepted an increased offer of compensation on her behalf," Senator Evans said. "The terms of settlement remain to be finalised and must be approved by the (NSW) Supreme Court." He declined to comment on the details of the settlement, but reports this week suggest the figure is around $2.4 million. Confirmation of the deal follows a three-year battle for justice by Ms Rau, an Australian resident who was held at Brisbane's women's prison and later in South Australia's Baxter immigration detention centre in 2004-05. She was detained after authorities failed to recognise her mental illness and assumed she was an illegal immigrant. Senator Evans said he had made it a priority to finalise the 247 cases identified by the commonwealth ombudsman in which people had been wrongly detained by the immigration department. "One of those priority cases was to finalise that of Cornelia Rau and end the terrible ordeal she has suffered," he told the senate's legal and constitutional affairs committee. Former prime minister John Howard apologised to Ms Rau and Australian citizen Vivian Alvarez Solon, who was wrongly deported in July 2005, for their mistreatment at the hands of the immigration department. The two cases were the trigger for a wide-ranging review of immigration department practices. The settlement follows a civil action by Ms Rau's lawyers in the NSW Supreme Court against the Federal Government and GSL, the private operator that ran the now-defunct Baxter detention centre. Senator Evans ruled out holding a royal commission into the immigration department. Labor in 2005 had called for a royal commission to examine immigration bungles after the wrongful detention of Ms Rau and deportation of Vivian Alvarez Solon. But Senator Evans said he was now satisfied that progress was being made towards cultural change in the department, stemming from the Palmer and Comrie reports commissioned by the Howard government. "There was no election commitment to a royal commission into the Department of Immigration," Senator Evans said. "I think most of those commentaries were made in relation to ... the very serious concern over the reports of the handling of the Vivian Solon and Cornelia Rau cases." Senator Evans acknowledged Labor's former immigration spokesman Tony Burke had demanded a royal commission rather than the Howard government's approach of adopting the Comrie and Palmer reports. However, events had since moved on, he said. "There will be no royal commission," Senator Evans said. In the past few months, the Australian government's treatment of asylum seekers has caused outrage among many in the Australian and international communities. No other government has gone to such great lengths to close its borders to people fleeing repression and terror. No other government has turned away leaking boats full of asylum seekers and refused to take responsibility for the consequences. No other government has so openly violated its international human rights obligations. Just days before the November 10 federal election, the Australian navy revealed that it had not told the government that asylum seekers were throwing their children into the ocean. Did the government lie about this incident to fuel its campaign to demonise asylum seekers? If this was a politically motivated lie, what else has been fabricated or covered up? Nothing less than a royal commission would have the power and authority to thoroughly investigate the Howard government's policies and actions toward asylum seekers, and the extent to which they violate international law and human rights. the government-legislated right to discriminate against refugees without documentation and those who have spent more than seven days in a third country on their way to Australia. Investigate the denial of work rights, Medicare, English classes and welfare access to those who apply for refugee status more than 45 days after arriving in Australia.